As June came to a close, I eagerly anticipated my attendance at the CASA conference as a good learning opportunity and to present with Ed Doadt on the use of social media in the classroom and school community. 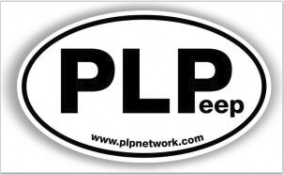 With a conference title of Pedagogy to Technology & Hardware to Headware I certainly felt some great learning and networking opportunities would unfold. the message seemed to be stay out of this arena and focus on aspects of education that are already proven by research. Two important questions emerged from this framework: a) why would we (educators) get into the innovation game in K-12 education where funds are limited?, and b) where is the research that demonstrates technology makes a difference? The audience reaction was rather subdued and there was a smattering of polite applause. While a few people offered up examples where technology was making an observable difference in student learning, the comments were essentially shot down based on statements of “lack of research”. There was a real sense of disconnect in the room. The view presented was polarized relative to current directions and thinking in this area by many. Audience member and conference presenter George Couros ended the session with a very important point: learning with technology is significantly different than learning about technology. I have been reflecting on this scenario since attending the conference trying to sort through the various perspectives that come into play. First off, I don’t think anyone would debate the 4 bulleted points outlined above. These are known facts that are well researched and documented. Teaching and learning with technology must be done well, and in the framework of best instructional and assessment practices. Learning WITH technology IS different: it is about NEW possibilities. 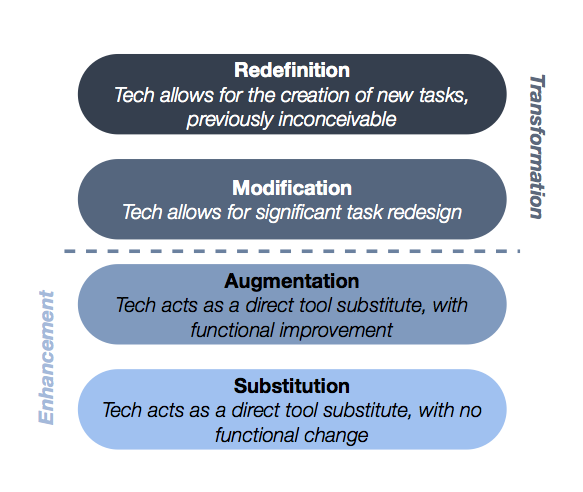 The SAMR model, as described in the diagram below, offers a great way to define stages of development in terms of how well technology may be used to support learning. Yet, there is this nagging question: why do educators want to move in this direction if it does not make any difference? So many people I talked to indicate that technology DOES make a difference in how students learn. Many shared reports that perceptual, observation based, focus group data etc. indeed show differences in this area. After chatting with several people after the presentation and some personal reflection time, I think there is an important perspective missing: the timing of the research (assuming that this should be researched at all). REMIX: In reality, we are still in the infancy in this area of teaching and learning with technology. We need to apply the right lens and connect the dots differently. Why? Learning how to use technology effectively in education is NOT wild reckless expensive innovation in my opinion. It is about doing things differently and exploring new possibilities. We are not at a point in time where enough teachers use technology effectively in their practice. To me, it would make sense that if one researches and measures the effectiveness of technology now, the results may indeed be somewhat marginal. Then again, if any educational tool/resource is used ineffectively, research will show that the impact of that tool/resource is marginal. So Now What? We need to consider the way in which the term innovate is used in the context of education. Like it or not, technology is here to stay. Learning to use it effectively is not reckless innovation or transformation. We need to learn how to leverage it in the most effective ways possible. This means trying things, and sharing the learnings — blogging about is would be great! I believe we need to invest in teacher training, close the gap, and raise the bar in the area of technology use. Continuing to gather data and formalizing research is a ‘must do’. Every educator needs to commit to sharing their learnings and best practices (add another plug for blogging). Finally, in the keynote, technology was portrayed as the big bad beast: you were IN or OUT. I strongly believe that we can not look at this sandbox stage as some definitive point of decision. We do need to continue leveraging learning WITH technology, exploring new possibilities and sharing. Perhaps it is time to throw a technology challenge on the table: eliminate technology from your line of work and personal use for a month — no corresponding, collaborating, note taking, internet enabled research/fact finding, analysing, exploring, reading, social media, email … well you get the picture. At the end of the month, reflect on whether or not technology makes a difference to how you work, then share your learnings by commenting on this blog post. I also wanted to share a few notable quotes from the #CASA13 Twitter stream from this session. One of the ISTE sessions I hoped to attend was Michael Fullan’s presentation about his new book Stratosphere. The session seating filled to capacity quickly and I did not make it in. Subsequently, I wanted to learn what happened at the session and am sharing the following resources related to the session. Book: Stratosphere: Integrating Technology, Pedagogy, and Change Knowledge by Dr. Michael Fullan. I look forward to hearing Michael’s keynote at ECOO 2012. I recently had an opportunity to participate in a Grand Magazine interview with Peter Berndt, Principal at Ryerson Public School in the Waterloo Region District School Board. 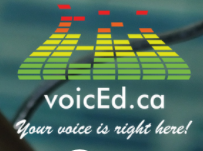 The article, linked below, captures the technology focus of the school and highlights the excellent work of the teachers in using technology to support student learning. Congratulations to Peter and the Ryerson staff for their excellent work with technology and forward thinking about student learning. This article is posted and linked for viewing purposes only with permission from the publisher. A special thank you to Nancy Silcox for preparing this article for publication. My wife and I enjoy solving crossword puzzles together, particularly in the summer when it is nice to sit out on the back porch. I will be the first to admit that I am not particularly great at solving the crosswords, but will plug away at it. One day we hit on a whole new approach to working on the crosswords that has made it a lot more fun for both of us. We recognized that the fun of working on a crossword was in the actual process of solving the puzzles. Rather than getting hung up, and perhaps frustrated, by not having enough ‘crossword knowledge’ at your fingertips, why not enhance your resources? We use internet searching to help us solve the puzzles. I am sure that crossword purists would roll there eyes at the thought of this. However, this simple addition to our approach has really made a difference in the enjoyment level of working out a crossword solution. Our strategy is to complete as much of the puzzle as possible without any assistance, then we take turns trying to track down the missing clues using internet search engines. I like this for two reasons. First, it is a great way to try out the different search engines and compare results. Secondly, it keeps your search skills sharpened up as you weed through the information to solve the puzzle. A bonus is that we learn from each other as we compare strategies to locate information. All in all, this approach is a hit from our point of view. Crossword time now means being outside, time on the porch, coffee/tea, laptop and wireless internet connection and more fun solving the puzzles. Off to solve the next puzzle clue!